(Photo by DiBella Entertainment/Ed Diller) By Chris Williams: Former WBC middleweight champion Sergio Martinez sees Manny Pacquiao and Julio Cesar Chavez Jr. as a couple of puppets, unable to make decisions on their own and just following along with whatever their promoter Bob Arum of Top Rank tells them to do. Martinez thinks that Chavez Jr. and Pacquiao are cowards for letting their promoter make the decisions for them, and thinks they should speak up for themselves as far as who they want to fight next. Martinez is right about both Pacquiao and Chavez Jr. deferring to Arum about the opponents they want to fight. Chavez Jr. openly admits that he doesn’t do the choosing and he doesn’t seem to be eager to resist Arum in the careful matchmaking that he’s been doing for the son of the Mexican legend Julio Cesar Chavez Sr.
With Arum’s help, Chavez Jr. has been able to capture the World Boxing Council middleweight title over Sebastian Zbik. If Arum weren’t in the picture, we might have seen Chavez Jr. fight Sergio Martinez before he was stripped of his title and Chavez Jr. would have lost that fight without a doubt. He’s a good fighter but isn’t at the same level as Martinez. Pacquiao tends to fight the guys that Arum picks out for him. You see that with Pacquiao fighting Arum’s Top Rank stable fighters Antonio Margarito, Miguel Cotto and Joshua Clottey. Arum doesn’t just put Pacquiao in with his own guys. Recently, Arum spotted 40-year-old Shane Mosley, a fighter on the downside of his career, and chose to put Pacquiao in with him in a safe fight that made Pacquiao a lot of money. Now Pacquiao is looking to fight one of Arum’s four fighters picked out for him –Timothy Bradley, Juan Manuel Marquez, Miguel Cotto and Lamont Peterson. 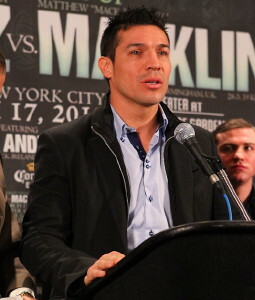 It’s thought that the two leading candidates are the biggest proven moneymakers of the bunch, Marquez and Cotto. One of those fighters will almost surely get matched up against Pacquiao next in June.